The asylum, or substantive, interview is when the Home Office interviewer will ask you in detail about your reasons for claiming asylum. The interview may last several hours and you will be asked lots of questions. You may be asked the same questions several times in different ways. 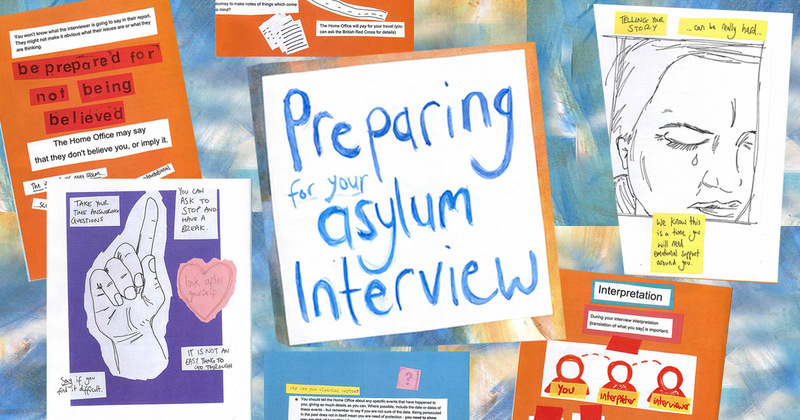 It can be a very long, difficult and traumatic interview, and could be the most important part of your asylum application. You are going to be asked questions about things that may be very difficult to talk about. Be prepared for not being believed. It is common for the Home Office interviewer to explicitly say they do not believe you. You need to be very clear, give as much detail as possible, and try to remember to include all the important information. Have friends, neighbours and supporters on hand to talk to before and after the interview. See the ACTION SECTION below. If you have a lawyer, they may ask you to tell them your story before the interview with the Home Office. The Home Office are now issuing some people with “Preliminary Information Questionnaires” after the screening interview and before the substantive interview. Read more about this here and ask your lawyer to help you fill in the form, as the Home Office will use information in this when considering your asylum claim. Your lawyer may also submit a written statement before the interview. If you are going to be explaining very upsetting events, this might be a useful thing to do, so that you do not have to be asked so many detailed questions about events (for example, with incidents of sexual violence). Not all lawyers will do this, as some lawyers feel it can be risky to submit a statement in advance that the Home Office interviewer can then “test” you on during the interview. A statement may also be submitted after the interview, particularly if there are things you weren’t given chance to explain or you think there were problems with the interview. If you cannot attend the interview, you must provide very good reasons for this, through your lawyer if you have one. If you are ill, get a note from the doctor; if there are transport problems, get evidence of this from the transport company. Without good reasons and evidence of these good reasons, the Home Office may refuse to re-arrange your interview and will assess your application on paper (which almost always leads to a refusal). If you are an adult and you have a legal aid lawyer, they will not normally be able to attend the substantive interview with you. If you are being held in immigration detention at the time of your substantive interview, however, your lawyer is allowed to attend under legal aid rules and so may attend the interview with you. “For reasons of confidentiality, a claimant will normally be interviewed alone or in the presence of a legal representative or regulated adviser. Exceptionally, however, and with advance notice, a friend or other companion may be admitted to provide emotional or medical support. Some people are now having their substantive interviews conducted via video conference: the person seeking asylum sits in a room in one location, and the Home Office interviewer and interpreter sit in another location, and the interview takes place over a video link. This means the interview is automatically recorded (which is good), but most people are not given a copy of this at the time of the interview (it is usually sent to their lawyer some days later). This makes it harder for you to check straight after the interview if there were any issues around interpretation or things you don’t think you explained properly. Childcare is now available during the asylum substantive interviews for male and female single parents with children under 5 years old (except in Belfast). You should inform the Home Office that you need childcare during the interview in advance – you can ask your lawyer to do this, or you can do it yourself. It is your legal right to have the interview audio-recorded. You or your lawyer must request this in writing, 24 hours or more in advance of the interview. If you are detained, you need to provide three days’ notice. If you have requested it, make sure the interview is recorded. The interviewer may not mention it, or may try and convince you not to have it done, but it is very important to have your interview recorded. These records are important: it may become clear later that your asylum claim has been refused because of something the Home Office said you said when in fact you didn’t, or something was written down wrong, or was misinterpreted. If your case goes to appeal, your lawyer can listen to the audio recording and compare this to what has been written down (with the help of an interpreter if necessary). You have the right to request a male or female interviewer, and the Home Office will usually grant this request. If you want to be interviewed by an interviewer of a particular gender, make sure you request this as soon as possible. If you request it just before the interview, it is very unlikely the Home Office will be able to arrange this. The Home Office will provide an interpreter for the interview. You can request a male or female interpreter. As with the request for a male/female interviewer, the earlier you make the request, the more likely it is to be granted. You may not be comfortable giving your testimony to an interpreter from your home country/community. You can request an interpreter who speaks your language but who is from a different country/community, but there is no guarantee this request will be granted. If there are any problems with the interpreter – you cannot understand them, they cannot understand you, they speak a different dialect, you don’t think they are being professional or you can tell they aren’t interpreting things correctly – it is very important to tell the Home Office interviewer and ask them to write it down. After the interview, you should also inform your lawyer if there were problems with the interpreter (or any other problems), but it is far better if it has been recorded at the time of interview. If there are discrepancies in your testimony because of poor interpretation during the interview, and these are used to refuse your asylum claim, it will be much easier to respond to the reasons for refusal if the problems were recorded during the interview. Big problems with interpretation will be impossible to ignore – for example, you do not understand the interpreter at all, or they do not understand you. But it is important to watch out for small problems too. Little things misinterpreted can have a big impact on your case. This might be something like the wrong date being used. It may be that there isn’t a direct equivalent in your language for a word in English and therefore the wrong word is used. For example, in some languages there is no separate word for “wrist” and “elbow” and “shoulder”, the word “arm” is used for all these. This can cause problems, especially when talking about injuries, and torture. The wrong grammar may cause a problem – is “he” and “she” being used correctly? Are you talking about one person (the singular) but it is being interpreted into English as two people (plural)? You may speak enough English to notice these errors, in which case you should correct them during the interview. Or it may not be until you, your lawyer, or one of your supporters looks at the transcript of the interview, and in light of what you have told them that the errors become clear. Request that your substantive interview is audio recorded. Make the request in writing, and more than 24 hours before the interview (or more than three days, if you are in detention). Make sure you are given a copy of the audio recording and the written transcript at the end of the interview. You have the right to request a male or female interviewer, and a male or female interpreter. Make this request as far in advance as possible. If you are not feeling well, are tired, or upset because of having to think about what has happened to you, tell the interviewer this. If you need a break during the interview, ask for one – this is your right, do not be afraid to ask. If you think there is a problem with interpretation, say so as soon as possible, and ask for this to be noted on the interview record. During the interview, you may be asked to fit your story into a chronological timeline of what happened when, perhaps in a way you are not used to. For example, “x” happened in 2009, then “y” happened in May 2010, after that “z” happened in June 2010. Alternatively, during the interview, the interviewer may jump around from event to event which can be very confusing. Take your time answering questions and think about what you want to say before speaking. 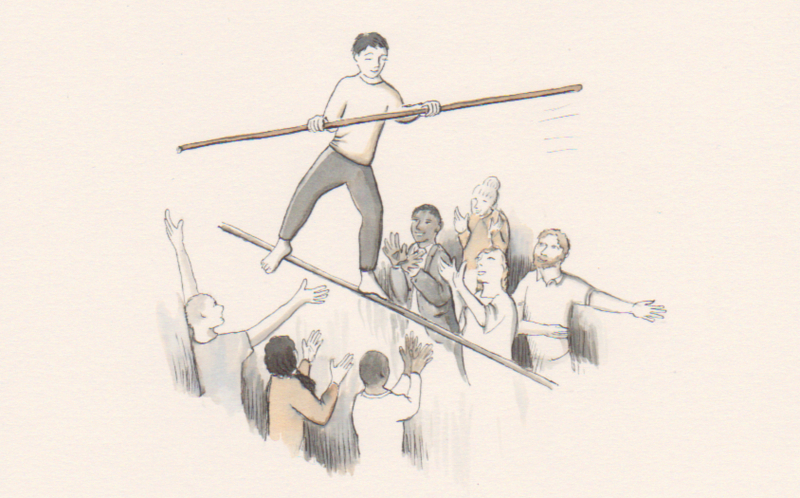 You might find it easier to draw a timeline of events – ask the interviewer if this possible. If you cannot remember a date, say you cannot remember. You may not be able to remember an event by a day or month but by the weather, the season or a family occurrence. You can explain these instead if you are sure of them. If there are ways of marking time that make more sense to you than an official calendar, such as an important church service or jobs you do as a farmer at a similar time every year, use these. For example, you may remember that something happened during Ramadan, or after the harvest. Or that it was winter, because the nights were cold. If you guess a date, and then say a different date at a different point in the interview or a later stage of your application, this will be used to doubt your story. Be clear about which calendar you are using. Always do this, whether speaking to your lawyer, an interpreter, the Home Office, or a judge. It is better not to switch between calendars as this can lead to mistakes. If you are used to using the Persian calendar, or the Ethiopian calendar, use that throughout your testimony and it will be converted to the Gregorian (UK) calendar by the Home Office or your lawyer (if you have one). If you have a lawyer, you can ask them to check that the dates have been converted properly by the Home Office, an interpreter or by themselves. Be aware that the person interviewing you may know very little about your country and/or culture. This can lead to misunderstandings in the interview, and ultimately to a refusal of your asylum claim. For example, you may use the word “auntie” or “uncle” to refer to someone you know. In the UK, these words have specific meanings – the brother or sister of your mother/father. If you use the word “uncle” in the broader meaning, for example if you said “my uncle in Kabul helped me”, it will cause confusion if you later say you haven’t got any family in Kabul. To be granted refugee status, you must show your fear of persecution is “well-founded”, meaning there is a real basis for your fear. Read more about this here. Many people are unable to get documentary evidence to support their case. This can be either because there isn’t a “paper trail” to show your activity or the persecution you experienced, or because evidence exists but you haven’t had time to get it sent to you yet. Because of this, your “evidence” at this stage of the asylum process will often just be your testimony about what has happened to you and/or what you think may happen. The Home Office will look at the information you gave in your screening interview and then in your substantive interview. They will check if there are any differences, or things they don’t think make sense, or that they don’t think are true. You may be re-telling difficult experiences, and remembering these events can be upsetting. It is important, however, to try and give enough detail about the events to explain them to someone who wasn’t there, isn’t from your country, and to explain why these events led to you having to leave your country. Giving details about a physical or sexual assault can be particularly distressing, but your testimony will be used to make a decision on your asylum claim. It is therefore important to include information such as who attacked you; what they were wearing; if they were police or army or secret police (and their rank if you know it); what they did to you; how often it happened, particularly if you were in prison/detention at the time; who was in the room; how you managed to survive. Watch this video from Asylum Aid (in different languages) where women who have themselves claimed asylum explain the kinds of things you may need to tell the Home Office interviewer about. Documentary evidence is often hard to get because of the circumstances in which you had to leave your country. Nonetheless, the Home Office tends to disbelieve what you say (your testimony) and so it is very helpful if there is genuine documentary evidence to support your story. Documentary evidence might include a political party membership card, an arrest warrant, a birth certificate, or newspaper articles about you or persecution of people like you. If you are going to submit any documentary evidence, make sure you have shown this to your lawyer beforehand and they have agreed it should be submitted. You can either give this evidence to the Home Office at the interview, or you have five days after the interview within which to submit any documentary evidence or any statements. If you are going to submit documents, make sure you know where they came from. Who sent them to you? How did they get them? If posted to you, keep the envelope they came in and any other proof of postage. Wherever possible, you need to submit original documents, not photocopies or scans. If they are in a language other than English, you (or your lawyer, if you have one) will need to get a formal translation. Never submit documents if you are not sure they are genuine – this could seriously damage your case. If possible, your lawyer should get an expert on your country/reason for claiming asylum to comment on whether they are genuine. This is because the Home Office position is that documentary evidence is likely to be fake. In addition to documentary evidence specific to your case, general information about the situation in your country from reliable sources may be useful. This is sometimes called “objective evidence”. This may show that what you have experienced fits a pattern of human rights abuses or persecution in your country of origin. This is particularly important if you were persecuted by a state official such as a police officer or army officer. You will need to demonstrate that the state cannot protect you from these people because state officials are routinely involved in these abuses, and that it was not just a one-off attack which would be unlikely to happen again. For more on where to find objective evidence, see After a Refusal section of the Toolkit. Although these questions may seem basic, these details could be used against you. Are you giving consistent answers about yourself, in this and other interviews/statements? What is your date of birth? If you do not know your date of birth, don’t make one up. You can say that you do not know your date of birth, and explain why (for example, do you have a birth certificate?). If you give an estimate of your date of birth, explain it is a guess (and what you are basing the guess on). What is your nationality? The Home Office may say they don’t believe you are the nationality you say you are. In your interview, give as much information and details as you can about where you are from. For example, which area did you live in? Where did you go to school? How many people lived there? What were the local languages? Have you ever been convicted of a criminal offence? If you were imprisoned/convicted in your country of origin as a result of persecution from the authorities, and you are now seeking asylum because of this persecution, give as much detail as possible. When were you arrested? By whom? For what reason? How long did you spend in prison? What were the conditions like? Did you ever go to court? Why were you released? Do you speak other languages? If you speak other languages, the interviewer will want to know how you know these. If you didn’t have a formal education or you are from a country with a poor education system, the Home Office may say they don’t believe you. You must explain how you know these languages. If you are not fluent in these languages, say so. Otherwise, the Home Office may try and interview you in these languages instead of your mother tongue. If you are not sure which date you left your country, give the answer as close as possible. What month was it, what year? Explain why you are not sure. Try to give any details you can about the time of year. Was it winter or summer (warm or cold)? Was it around Ramadan or another festival? Was it around the harvest or another important time of year? If you give different dates in different interviews, this will be used to doubt your story. If you left your country a long time ago and you are not in contact with your family, the interviewer may ask you how you know information about your home country now. If you’re not in contact with your family, how do you know you would still be at risk if returned? If you are in contact with your family in your country of origin and they are in danger/are being persecuted, it may be helpful to get as much details/documentary evidence about this as possible (without putting them at risk). Did you claim asylum in any of the other countries you have travelled through? If you claimed asylum in another European country or you could have claimed asylum but didn’t, the Home Office will say your asylum claim is not their responsibility and will try and remove you under the Dublin regulations. If you did not claim asylum in another country on the way to the UK, the Home Office will want to know why.Remember: in this interview, you are explaining why you need international protection (refugee status or humanitarian protection). You may have specific reasons for wanting to come to the UK – personal contacts, family, friends, religious, political or community connections. The Home Office interviewer may not understand that “wanting a better life” can include needing to be protected from persecution and wanting to work or study in the UK – be very clear about why you had to leave your country and why you can’t go back. Why are you claiming asylum? You should tell the Home Office about any specific events that have happened to you, giving as much details as you can. Where possible, include the date or dates of these events – but remember to say if you are not sure of the date. Being persecuted in the past does not in itself mean you are need of protection – you need to show you are risk of something happening if you were returned to your country now. Was there a specific event which made you leave your country? Was it just one event that made you leave? If you’d been suffering persecution over time, what was it about that final event/threat that made you leave, then? You should try and give your answers in chronological order (the order in which they happened). See section on ‘dates and times’ above. Why can’t you return to your country (or another country you’ve come from)? What could happen to you if you did? Who are you in danger from? The government, military or police? If you are not in danger from the authorities, but from a ‘non-state agent’, you will need to explain why you can’t get protection from the authorities. If you are describing events that have already happened to you, did you report what happened to you? If not, why not? Would you be safe going to live elsewhere in the country? The Home Office may say you are only in danger in one village, city or region and you could ‘relocate’ somewhere else. If you have already tried going to another area of your country to escape from danger, explain why you could not stay there. If you stayed there for a while, what made you leave in the end? Has the threat affected other people? Has anyone in your family experienced the same treatment? It is important to give relevant information if someone in your family has or is still experiencing the same treatment. If someone in your family has been granted asylum in Europe because of it, mention this and give details. If your family or other people persecuted in the same way did not leave the area, why did they not leave? Why did you leave and they didn’t? If family members or other people in similar situations to you haven’t been threatened, explain why you have. If you were imprisoned in your home country as part of your persecution, you will need to explain how you were released, or if you escaped explain how you managed this. The Home Office are usually very suspicious of escape stories – be clear about how this was possible, and don’t assume the Home Office know anything about how things work in your country (clan/ethnicity loyalties on the part of guards, common bribery etc). Are other people facing longer sentences/torture, and might this happen to you if you were imprisoned again? If you were mistreated while you were imprisoned, make sure to give information about this. Were there bad conditions/incidents of torture? For example, many people sharing a small cell, withholding of food rations, no “yard” time outside, or were you kept in isolation? Do you have any medical or psychological problems? Are these a result of torture/mistreatment in your home country? You should tell the Home Office about these, and show them any evidence of this (if you have scars on your body, do not just show these during the interview as this may make the interviewer angry. But you could say you have scars and can show these when appropriate). You should also speak to your lawyer about getting a ‘scarring’ report, or other medico-legal report. Your testimony in the asylum interview may be the only evidence you can provide. You are going to be asked questions about things that may be very difficult to talk about. Try and think about ways you can try and remain calm and protect yourself when talking about emotional issues. You may find it helpful to practice in advance of the interview, using the guidance above about questions you may be asked. Is there someone you trust you can do a “mock interview” with? Remember, if your friend/supporter is playing the part of the Home Office interviewer they should not be too friendly! Are there parts of your story that don’t make sense to them? Is this because there are things you’ve forgotten to say? Or there things that don’t seem that important to you but are crucial to explaining the story to someone who wasn’t there? Some people find it useful to write down the important points of the story, or draw symbols and pictures, to get it straightened out in their head before they are asked questions in the interview (often in a confrontational way). You will not be able to take these into the interview with you, however. You may wish to write out, or tell a friend who will write it for you, a timeline of the events that took place leading up to you having to leave your country (this may cover many years). Discuss this with a friend, and it may prompt memories of important facts or details that you had forgotten. Be prepared, but in your interview try not to sound like you are repeating a script from memory or sound rehearsed, as this may sound like you are not telling the truth. Make sure you know where your interview will be (visit the place in advance of the interview), how you will get there and how long it will take to get there. Being late or being lost will distract you from focusing on telling your story in the interview. Be prepared for not being believed: it is common for the Home Office interviewer to explicitly say they do not believe you, or make comments hinting as this. You need to be very clear, give as much detail as possible, and try to remember to include all the important information. Have friends, neighbours and supporters on hand to talk to before and after the interview. This is a crucial time for emotional support from those around you. Soon after the interview, perhaps the next day, you can go through the transcript to check for any mistakes or misunderstandings in your answers, or how they were written down, or in the interpretation. You might find it useful to have a friend/supporter to help you with this. It may be several months before you receive your asylum decision based on this interview, so it is best to look for potential problems while it is still fresh in your mind. You can submit documentary evidence or statements explaining any issues that occurred during the interview to the Home Office within five days of your interview.